CMP's business writing course equips you with the skills you need to produce effective and persuasive professional communications. From emails and reports to webpages and social media content. Every organisation has a constant need for a variety of internal and external written communications. However, many organisations send out badly-written documents, text which is full of grammatical errors and communications that are hard to read. CMP's comprehensive business writing course teaches you how to produce clear, concise and reader-friendly communications that boost your employability and enhance the reputation of your organisation. If you struggle to compose professional communications, our online business writing course will teach you how to put your thoughts on paper, clearly and effectively. For many organisations, writing is treated as a secondary skill or even an after-thought. However, professional and readable business communications can set you and your organisation apart from the competition. CMP's online business writing course takes you back-to-basics and helps you develop your skills, with tutor support every step of the way. We train you how to write communications which are grammatically correct, easy-to-read and convey the exact message you want to get across. You will also learn how to construct webpages, business blogs and social media content that get results. It's important that you study with a provider you can trust. 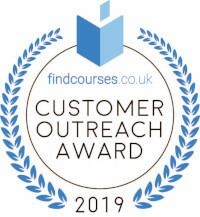 We have been successfully delivering our online courses since 2003, and are one of the most trusted and respected names in the industry. We are fully accredited by the ABCC and the EADL, and are listed on the UK Register of Learning Providers, which is run by the government's Department for Education and Skills. Online courses are different. But most people find they are more effective and convenient than face-to-face study. You study when, and where you want to. The duration of this course is 60 hours. You fit these hours in whenever is best for you - we offer complete flexibility, with no deadlines or time limits. You can enrol when you like and begin whenever suits you. There are no fixed start dates. We sometimes limit student numbers on each course to a monthly quota. This is to ensure we provide you with the highest quality tutorial support. After you enrol, we send you our Enrolment pack, this explains how we work, and lays out some general guidelines. You then email us for your login details for our Online Learning Area (OLA). We send you our Graduation pack. We then send your diploma in the post. The level will be determined by your average coursework grade. A = Distinction. B = Merit. C = Pass. We can also help you find work, help you develop your career, and offer expert advice at no additional fee. We provide you with a personal course tutor who will work with you 1-2-1 and mentor you through the course. Cleland has provided writing training for some of the UK's biggest businesses and websites, including Intel, Sony and United Utilities. He is a leading blogger, with regular a column at the Press Gazette which attracts thousands of hits every week. He also contributes to several other sites. He will mark your assignments, answer your questions and give you friendly help and advice. 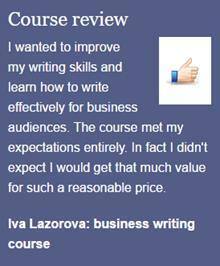 This course has attracted plenty of positive course reviews, like the one below. You can read all of them on our own website, or on the reviews section to the right of this page. This course is suitable for anyone looking to develop enhanced writing skills that will benefit them as well as the company or organisation they work for. There are no requirements for this course, it's for beginners, or for people wanting to refresh or redefine their skills. This course is also suitable for Apple Mac users. The course leads to the CMP diploma which guarantees you can produce copy to a recognised standard. Many people say they "work as a writer". But our accredited business writing diploma will set you apart. You will have the skills to work effectively as a writer, across traditional and new media platforms. You will have a respected qualification that will enable you to apply for jobs within the writing industry. You'll also have complete confidence in your writing skills, whether that's at work, or at home. ​The Charter Mark is our assurance of accredited educational quality. We award it to students who have graduated from one of our courses or training programmes. It helps them to find work. Holders are licensed to use it on their websites, stationery, and social media profiles. The Charter Mark guarantees that holders have achieved set standards of competence in a given field. It gives employers confidence that applicants for staff positions or freelance work have received accredited training and independent assessment. This course covers everything you need to know to get started in the world of business writing. Fill out your details to find out more about Business Writing Level 4 Diploma. I took this course to improve my technique in writing for the web, social media and blogging. The lessons were very thorough and the online materials included reference material covering many aspects of good business writing. The feedback on my assignments was concise and always constructive.